There’s nothing more satisfying than creating bouquets from plants grown in your own landscape and gardens. This time of year there is an abundance of perennial and annual blooms and foliage that can brighten your indoor home décor. 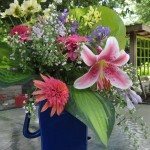 This article only scratches the surface, bouquets can also be made with trees, shrubs, ferns, grasses and bulbs. Stroll your garden with a pair of sharp scissors and exercise your creativity. Here are a few suggested annual and perennial plants you may already have in your garden, or may want to add now for next year. The ever popular Hosta is considered by some gardeners as the basic plant for backyard bouquets because both its leaves and flowers can be used. Hosta come in a variety of sizes, colors and textures and its flowers, in shades of lavender and white, are attractive to hummingbirds. One of our favorite Hosta for bouquets is ‘Sum and Substance’, a large-leaved type which grows in shades of light green, depending on the amount of sun it receives. As a dramatic accent in your bouquets, try Liatris spicata ‘Kobold’, commonly called blazing star. This perennial grows in clumps and bears spikes of purple fluffy flowers. Another easy to grow perennial, Coreopsis verticillata ‘Moonbeam’ (threadleaf coreopsis), brightens bouquets with it creamy yellow flowers borne on long stems. Coreopsis ‘Mercury Rising’ has violet-burgandy petals and also makes a great cutting flower–actually all varieties of Coreopsis make great cutting flowers. ‘Tis the season for lilies. Both daylilies and their Asiatic cousins make great additions to a bouquet. A great choice is the dramatic Lillium ‘Stargazer’. Garden phlox (paniculata) grow in a wide variety of colors and are bursting forth into bloom in gardens now. Taller types, like ‘Nicky’ and ‘Pixie Miracle’, offer fragrance and are long-lived in a vase. The ever popular and boldly colored Rudbeckia, or black-eyed Susan, is both an annual and a perennial in our climate zone. Species hirta is an annual plant and a popular cutting variety is blazing yellow ‘Indian Summer, or you might try multi-hued ‘Autumn Color’. If you prefer a perennial try Rudbeckia fulgida ‘Viette’s Little Suzy’’ or Rudbeckia speciosa. As for making bouquets either type offers beautiful results. Now in full bloom, don’t forget to include: Monarda, bee balm; Achillea, yarrow, and Veronica. Watch for fall Anemone and Aster, blooming soon in gardens near you. Annuals are great for cutting because they bloom profusely and over a long time. For a splash of long-lasting bouquet color nothing tops Zinnias. These annual plants come in a wide variety of colors: red, rose, orange, yellow, white and even bi-colors. Zinnia plants in flower are readily available at The Growing Place now. Among annual salvia, ‘Victoria Blue’ adds dash to summer bouquets. The showy blooms of Cosmos make great cut flowers, and ‘Sonata’ mix offers long stems and a kaleidoscope of colors: white, pink shades and carmine. The star-shaped clusters of Pentas flowers attract butterflies in the garden and draws accolades when used in mixed bouquets. Pentas are easy to grow, thrive in the heat of summer and ‘Starcluster’ mix blooms lavender, red, rose and white. With a little planning you can have the pleasure of decorating with homegrown bouquets starting with daffodils in April to mums in October.